Its time to test that grey matter again and see if you’ve got what it takes to take on the Mighty Edwins Quiz. 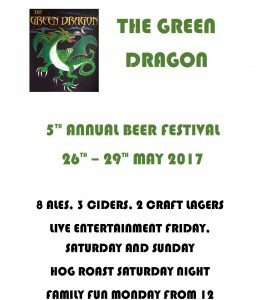 The meat raffle is returning to the Green Dragon. Are you interested in all things spiritual, metaphysical, ethereal, mystical and celestial ? Then why not join us for a night with Julie. Julie is an experienced Medium who will connect with people you may know from the other side. As a group we will sit and listen to what she has to say then we will take a break to top up our fluids and tummies with a slice of Pizza and a Glass of Wine. Tickets cost £10.00 and must be paid for in advance. Spaces are limited so book now to avoid disappointment. If you would like a personal reading with Julie afterwards please pre book this also in advance.